Superbe auberge ! Nous avions fait l’erreur de prendre un taxi qui essayait de nous entuber, Sergueï est arrivé en renfort et nous a sorti de la. Tout le monde est très sympa et accueillant. Les douches sont vraiment très bien, un grand confort partout. Et les chambres sont très bien aménagées, rien à redire, une des meilleures auberges de nos vies ! Avec de très bons conseils pour les restaurant et les visites ! 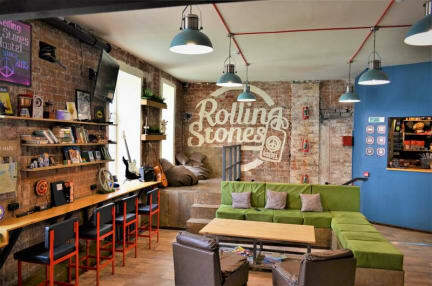 I had a great stay at Rolling Stones Hostel! The staff were excellent. Very helpful and friendly. There is also a nice social atmosphere here. Would certainly stay again! Great place! Beautiful set up and great staff. Perfect 10! Had a really wonderful stay in Rolling stones...everything was perfect. Good English spoken by staff. Very knowledgeable & helpful with everything. Good collection of Tourist Office information held in hostel. Dorm rooms are purpose built pods. Nice & roomy; wide; possibly short in length for a 6ft male. Very private & noise baffling. Wow what a hostel! The place is very clean and set out well. Staff are super friendly and make awesome coffee. the kitchen is very clean and well thought out. I loved laying cards and drinking wine with everyone and playing Jenga. You. Guys are a credit and I wish you all the best. Good luck with everything and I hope to see you again ! First thing is first- the atmosphere of this place is unbeatable. I spent a week there and it was just so much fun. Irkutsk is a gathering point of all people that are taking the trans Siberian route, and this hostel has the perfect common area to help you meet them. I met friendly people that were staying for short and long term. Also it's really close to a really great bar. Also the beds are quite private, the showers are plentiful and clean. Really, it's a perfect place. This is probably the best hostel we’ve stayed in in Russia. Great atmosphere, new, clean modern facilities and friendly helpful staff. 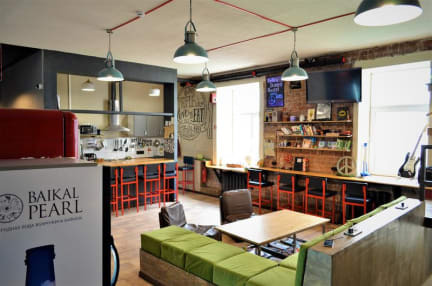 We haven’t marked them down for this but a bit of feedback we have is that they offer free tea, rice, pasta, oats and plenty of others which is great but they don’t offer free coffee or drinking water which seems like a ploy to make more money off guests and they are services which much worse hostels offer. That said I enjoyed the stay and would recommend it. Good helpful staff. Good kitchen facilities, great location to walk the city.